#1 Why Having a First Aid Kit is Important? Most people don’t realize the importance of having a first aid kit until they need it. While having a first aid kit might seem insignificant, many people are surprised to discover the impact and significance first aid kits can truly have. That being said, continue reading to learn about ten of the most important reasons why having a first aid kit is important! You cannot live your life relying on other people. Let’s face it: you never know when an injury could occur. That’s why it’s important to have a first aid kit, or to make sure someone you live with or someone you’re traveling with has a first aid kit. But, it’s not the smartest decision to rely on someone else to purchase and carry a first aid kit. That’s why you should purchase and carry your own first aid kit! After all, even if you don’t need to use the first aid kit yourself, you never know when you could be the first responder to someone else. Although not every injury includes blood loss, a lot of injuries do. A scary reality of blood loss is how quick it occurs. At first, it might seem like there’s only a minimal amount of blood loss. But, before you know it, it might be hard to slow the blood loss down. That’s where a first aid kit comes in handy. While a first aid kit will not stop blood loss from a serious injury, it can help limit and slow down blood loss until first responders get to you. If you have kids, there is no doubt in my mind that you need a first aid kit. Kids love playing outside and being reckless, and that’s fine. But, playing outside and being reckless as a kid often means getting cut or scraped. That being said, it’s important to be prepared for when these things happen. It’s good to have common first aid items that a standard first aid kit would have, such as bandages and ointment. After all, you never know when your little one could come inside with an injury. While there are no laws regarding owning a first aid kit for home or auto use, there are laws that regard owning a first aid kit for business use. Basically, every business is required to own a first aid kit and have it located in an easily accessible area. It’s important to note that if you own a business and do not have an easily accessible first aid kit on hand, you run the risk of being held liable for employee accidents and even being sued. It’s also important to note that you shouldn’t own just any old first aid kit. Instead, your first aid kit should have specific products and qualities that at least match ANSI standards. Think of your first aid kit like your plan A. In the event that an injury occurs, your first aid kit should be the first thing you reach for. While it’s important to call 911 in the event of a serious injury, having a first aid kit could be beneficial for caring for an injury while you wait for first responders to arrive. Even if you never have to use your first aid kit, it’s good to have. After all, your first aid kit acts as an extra level of protection that could ultimately save your life or someone else’s life. Owning a first aid kit is budget friendly for a variety of reasons. Firstly, it’s smarter and cheaper to purchase a first aid kit rather than purchasing all of the products you find in a first aid kit separately. 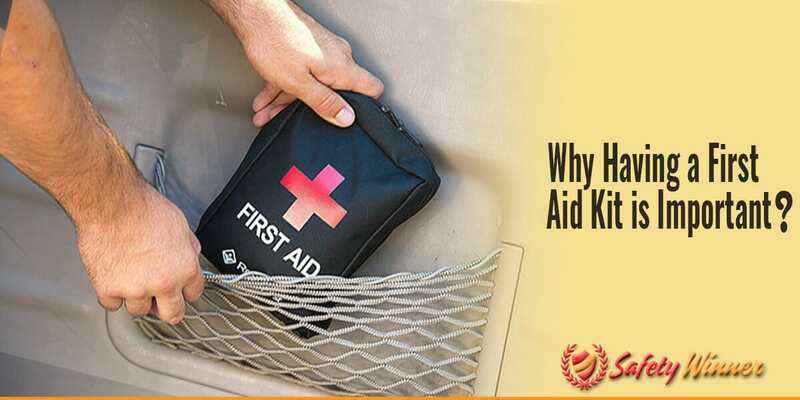 Even though first aid kits only have a limited amount of products inside, they have a wide variety of products that are extremely versatile and useful, and are offered for a moderate price. Another way first aid kits are budget friendly is the fact using a first aid kit to tend to an injury is cheaper than seeing a doctor. For example, if you fall and scrape your knee or slightly burn you hand on a pot, it would be cheaper for you to care for your injury with a first aid kit than for you to call 911 or visit a doctor. With minor injuries, such as scrapes and burns, you can easily care for them by yourself. But, if you neglect these injuries, you might develop further complications have to seek professional medical attention. Let’s face it: an injury could happen anywhere at any time. Whether you’re the most cautious person or the clumsiest person, accidents happen. That’s why you should expect the unexpected and own a first aid kit! While first aid kits can’t fix all injuries, they can fix minor injuries and at least lessen the severity of serious injuries until first responders arrive. While all injuries should be tended to in a timely manner, time is especially important for critical injuries. If you experience a critical injury, it’s extremely important that you seek care as quick as possible because every second counts. Like previously stated, it’s always important to seek professional medical help for critical injuries. But, it can take a few minutes for medical professionals to arrive. That being said, afirst aid kit acts as a temporary fix to the ticking time bomb that comes with experiencing a critical injury. Sometimes, injuries get worse over time. While this can happen with any injury, it specifically happens when injuries aren’t tended to in a timely manner. For example, an initial minor cut might turn into a larger infected cut if you don’t properly treat it right away. That’s where a first aid kit comes in handy! In order to prevent future complications, you can easily use your first aid kit to tend to a minor injury or aid a major injury while help is on the way. Let’s face it: an accident could happen any place at any time. Sometimes, accidents don’t happen at all. Of course, there’s the possibility that you will never have to use your first aid kit. But, if you own a first aid kit you will have peace of mind knowing you’re prepared for any possible accident or injury. So, be prepared and purchase a first aid kit!